The 5th Annual Starkville Restaurant Week is in full swing, and we’re celebrating some of the best culinary experiences Starkville has to offer! We are excited to bring Jay Reed, author of the Eats One Ate food blog, back again this year to share his insights on a few of Starkville’s favorite eateries, sponsored by Mitchell Distributing. 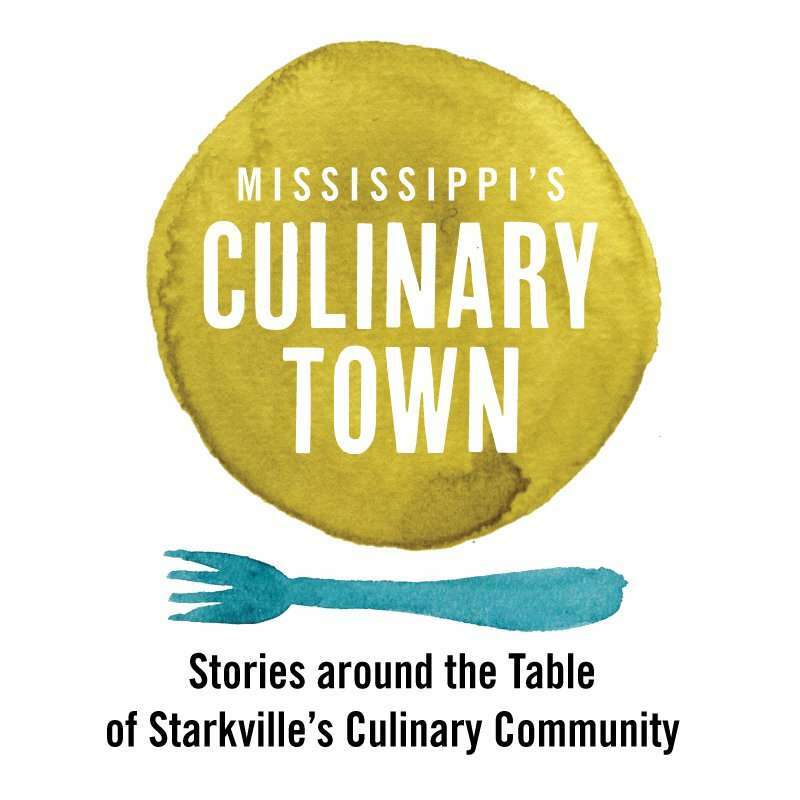 In addition, we are very proud to launch a new adventure showcasing Starkville’s culinary community… Mississippi’s Culinary Town! 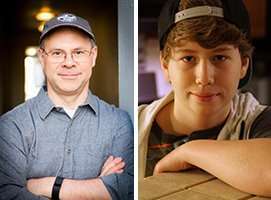 The video series features Jay, along with Mark Coblentz, Starkville’s own 14-year-old chef who most will recognize from his recent top 10 stint on FOX Network’s MasterChef Junior. 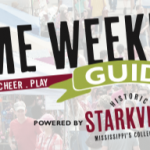 Pull up a chair as we take a tour of the vibrant culinary culture of Starkville! You’ll meet local chefs and food crafters, visit some of our favorite restaurants and culinary events, and listen in on the conversations where foodies become friends. City Bagel Cafe. Those three simple words conjure up images of warmth: a cup of steaming coffee on the table next to a fresh chewy bagel slathered with cream cheese. Perhaps yours is stacked with bacon, egg and provolone with a companion cappuccino. Mine is likely to be buttered and toasted with a generous portion of cinnamon and sugar, the same way my mother made cinnamon toast. 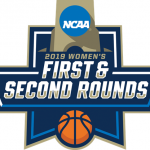 Bagels are the unofficial culinary mascot of New York City, but we are a long way from there: we are in Mississippi, almost directly between downtown Starkville and Mississippi State University. And this is our place. It has always been locally owned, the bagels made fresh every morning. It’s a place where people meet, for business and pleasure, for group study or quiet contemplation. This is the City Bagel that I know best. But there is another side to this locally grown Starkville institution: Italian Night. Actually, it’s four nights – Wednesday through Saturday. And on these four nights the menu is completely transformed. My previous experience with Italian Night has run the gamut when it comes to menu selection: Shrimp and Grits (aka polenta cake) with my family, Spaghetti Carbonara with friends, pizza and a calzone for my birthday. I made the choices, and have fond memories of good food and good company. On my most recent visit, in preparation for Starkville Restaurant Week, the folks at City Bagel chose the menu for me and my sidekick, Mark Coblentz. If you have followed Mark’s journey, you might know that he is already a chef at fourteen years old. Skeptical? Then how about this: Mark is the only kid ever to have appeared on both Chopped Junior (Food Network) and MasterChef Junior (Fox). That’s quite a resume for someone his age – or someone my age, for that matter. Dillon Han, the new chef at City Bagel, has quite a resume, too. Originally from New England, he studied at Johnson and Wales in Providence, Rhode Island, then began a tour of the world’s cuisine by way of several restaurants up and down the east coast. From scratch-made Italian-influenced pub grub, to seasonal local American cuisine, to French fine dining. From a vegan experience to a tutorial in Southern meats. Then he landed here, just as City Bagel was entering a season of transition. We started off the meal with a traditional Italian dish, Pasta Bolognese. This was intended to be a “warm-up” plate before the true meal began: Mark had been at football practice, and I had just left work. We were hungry. At the same time, we knew more dishes were coming – we’d have to pace ourselves a bit, but that wasn’t easy. Bolognese is not something I would ordinarily order – too simple, too plain. That’s what I used to think, because once Chef Dillon got his hands on it, all that “simple and plain” got thrown out with the pasta water. His recipe uses veal, pork, beef and pancetta, all cooked down together until there is a little crust and rendered fat – that’s when flavors are released. Then he builds it back up, adding tomato paste, mirepoix (carrot, celery, onion), spices and herbs. Next it’s deglazed with red and white wine, reduced to almost nothing again; then he adds chicken stock and reduces it again. Chef Dillon said, “When you take a scoop of Bolognese, it’s supposed to be super intense.” Now I know what intensity tastes like; Mark put away an entire serving of intensity by himself. 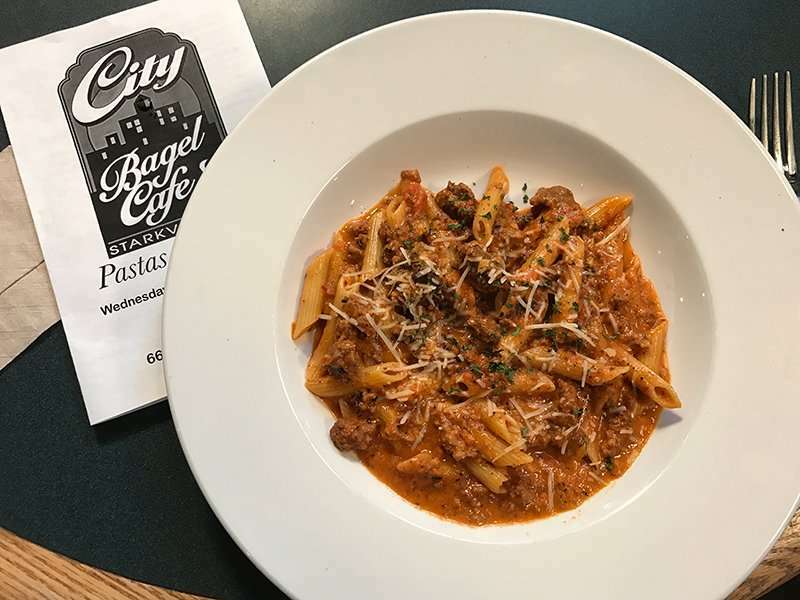 Our next taste was also from the pasta family, something that has been on the City Bagel Italian menu a while, with perhaps a few tweaks. 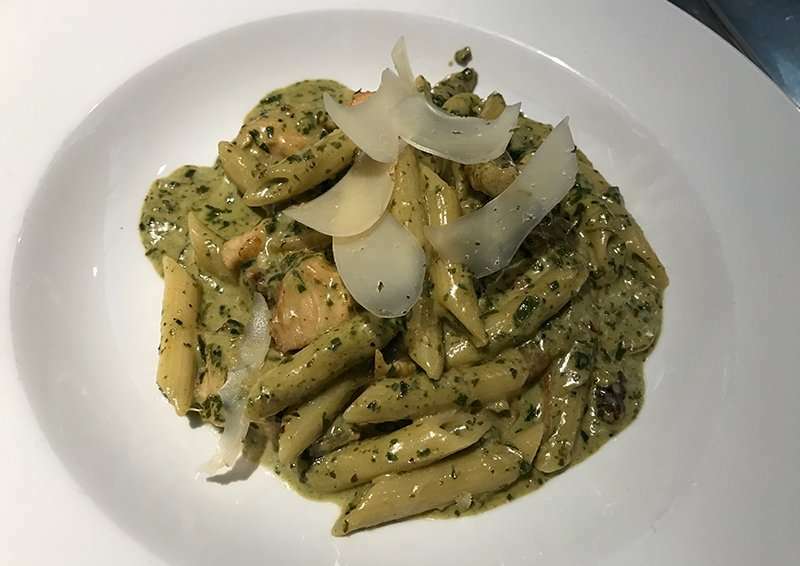 If Bolognese represents the red stripe on the Italian flag, the Chicken Penne Pesto is the green. It starts with chicken breast, brined overnight in a lemon bay leaf brine. The pesto is made fresh weekly from fresh basil, bread crumbs (from the bagels), olive oil, garlic , parmesan cheese, and walnuts. Everything is cooked separately, then brought together so the flavors become one. Chicken seared, onions caramelized, bechamel transformed to Mornay sauce via Parmesan cheese. Another seemingly simple dish, but there is much technique involved – and a lot of love. The dish comes from the region of Liguria – Genoa is the main city, where pesto originated. This is also the region of Italy that Chef Dillon is focusing on right now, and was the inspiration of this month’s special. 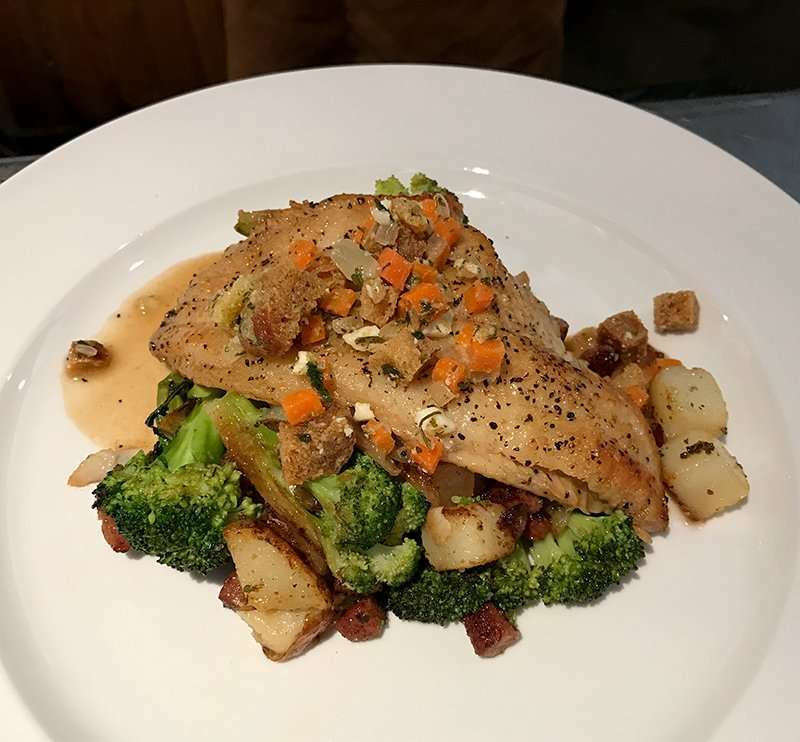 The Italian name of this Liguria-inspired special roughly means, “White Fish over Potatoes and Onions.” Chef Dillon interprets that as a onion and potato hash, adding garlic, oven-charred broccoli, and Country Pleasin’ Andouille Sausage. Though hyper-regional to Liguria, he gives it even more local flair by using Mississippi’s own Simmons catfish, simply seared with salt and pepper, deglazed with white wine for acidity and flavor, then basted with brown butter. Topping it off is a sprinkle of salad composed of mini-croutons (also from the bagels), olive oil, vinegar, sauteed carrots, onion, garlic, fresh herbs and lemon juice, adding a unique splash of brightness to the fish. I had seen the catfish on a friend’s plate before we began, and was relieved to find out we’d be trying it. Then I heard that we’d also be tasting the shrimp and grits. Oh boy. Let’s take it layer by layer. The base is a creamy Parmesan polenta, from the same family as our typical Southern grits, but a little more Italian. The traditional dish has some kind of pork, very often bacon, but Chef Dillon wanted to do something different and settled on the shoulder. The meat is scored and rubbed with a spice blend, left alone for two days, then slow roasted and basted for 8 hours, till it falls off the bone. The sauce is a peperonata: charred red onions and sweet peppers, crushed tomatoes, fresh herbs, salt and pepper and garlic, all individually prepared, then brought together and slow roasted in the oven. And the shrimp – though part of the name – are really there to add another layer of flavor to the plate. 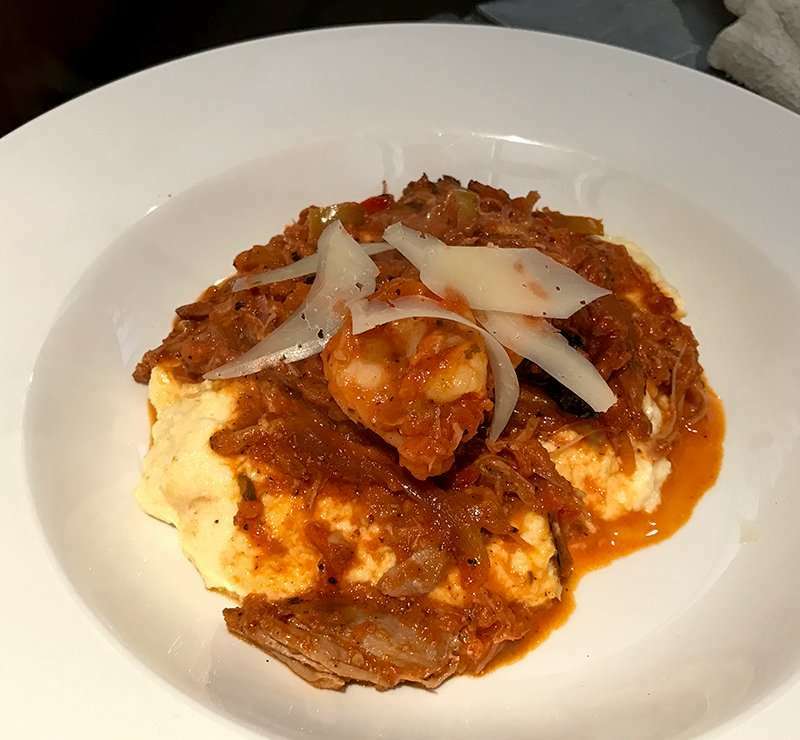 As a shrimp and grits guru, I put all available thumbs up for this Pork and Polenta interpretation. I’ve met a lot of chefs who have studied technique, or dug deep into the history of a dish, but I don’t think I’ve ever met one quite like Chef Dillon, who studies the culture of a people to better understand why they eat what they do. I got a geography lesson just sitting down to pick apart these dishes. No doubt Starkvillians and visitors to Mississippi’s Culinary Town are the lucky students sitting in his night class at City Bagel. Mark Coblentz is a 14-year-old chef from Starkville, Miss. He was in the Top 10 of this season’s MasterChef Junior series on FOX, and was a finalist on Chopped Junior on the Food Network. He is an 8th grader at Armstrong Middle School where he plays center on the football team. Thank you to Mitchell Distributing for being the title sponsor of our SRW Featured Restaurant Reviews. The restaurants reviewed provided additional sponsorship. All views and opinions are those of the reviewer, Jay Reed.